Scrumpy was born on March 29, 2003. His lineage is quite spectacular. His great, great grandfather was Secretariat – his great grandfather was Seattle Slew and just recently, we came to know that he is a cousin to California Chrome. 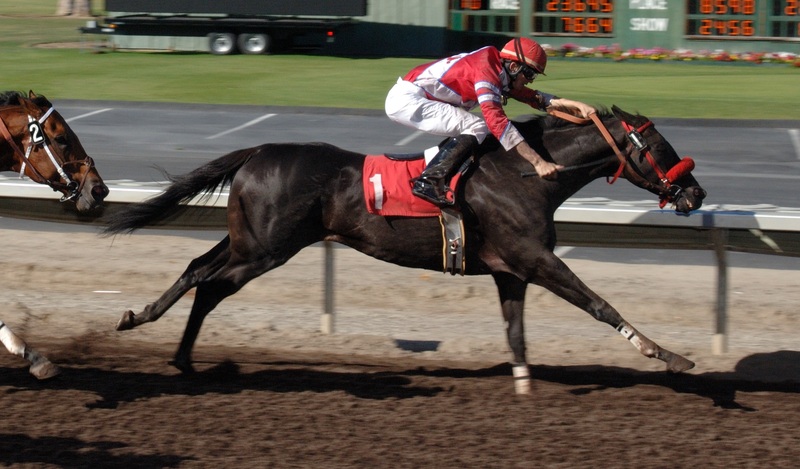 On March 6, 2006, Scrumpy, now 3 years old, ran his first race at Golden Gate Fields in San Francisco and WON! Over the next two years, he had 23 starts and won nearly $200,000. In 2008, Scrumpy, racing with an injury, was won in a claims race. Now in the hands of a new owner, he disappeared from the track. No one knew what became of him for 2+ years. 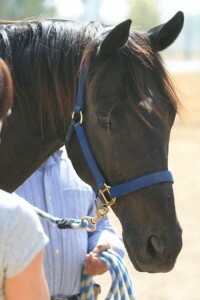 In December of 2010, Scrumpy showed up at the Los Alamitos race track in Southern California – then known as the skid row of racetracks. Now nearly 8 years old, Scrumpy was being trained to race again, even though he suffered from a severely bowed tendon on his left front leg. A bowed tendon on a racehorse can be a career ending injury, especially if the injury is not treated properly. Rehabilitation generally requires anti-inflammatory medications, twice daily cold hosing – a steady, forceful stream of water targeting the injured area, leg wraps and depending upon the severity of the injury, sometimes up to a year of limited activity. Alarmingly, someone at the track applied a heating liniment to his injured leg, covered it with a gel cast and left it on for an incredible, unacceptable amount of time. When eventually removed, Scrumpy’s leg was horribly burned – a swollen, bloody, smelly, infected mess. Rather than provide him with the proper veterinary care, his owner decided to sell Scrumpy to a “kill buyer”, a common practice in the racing industry when a horse is no longer able to compete. Now deemed worthless, Scrumpy was sold for the price of his meat. The following day, Scrumpy was to be loaded onto a slaughter truck and hauled across the border to Mexico. Horse slaughter facilities in Mexico are beyond your worst nightmare. Unwilling to pay for the price of a bullet or a captive bolt, most all of the horses shipped to slaughter in Mexico are herded into narrow chutes and stabbed repeatedly until they fall. 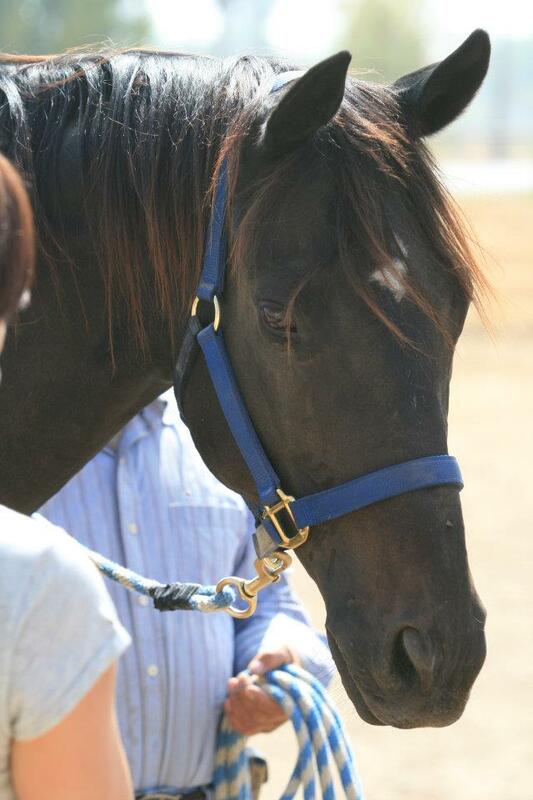 Fortunately for Scrumpy, an exercise rider at the track in Los Alamitos, aware of Scrumpy’s fate, had the presence of mind to call TROTT USA, a Thoroughbred rescue organization in Southern California. The exercise rider informed Bonnie Adams, President of TROTT USA, that Scrumpy was scheduled to leave for slaughter the following day. Immediately, Bonnie left for the Los Alamitos Race Track and bought Scrumpy back from the kill buyer. For the next year, Scrumpy was “laid up” in a safe pasture and his injured leg was tended to daily. Once healed, Scrumpy was entered into TROTT’s retraining program. Depending upon his abilities, Scrumpy might have been retrained to be a Dressage horse – or a jumper or a trail horse. It soon became apparent, though, that Scrumpy was not a suitable candidate for retraining. 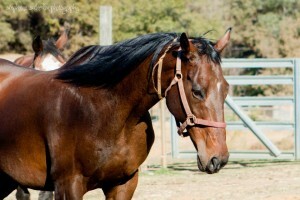 He could no longer run – nor jump, become a Dressage horse or even go out on a long trail ride. Even though put up for adoption, no one wanted to adopt a broken down racehorse with a permanent, debilitating injury. With no forever home to be found, Scrumpy’s only option was to take up residence in Bonnie Adams backyard. 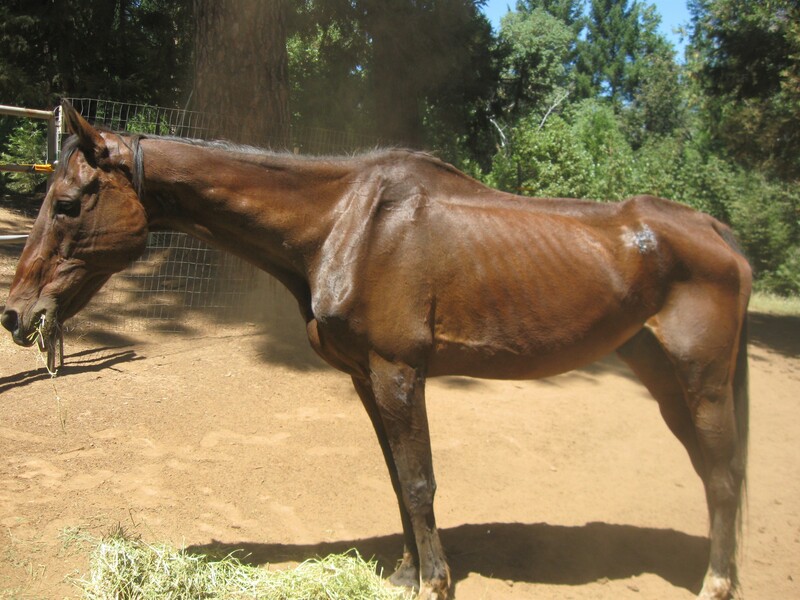 TROTT USA became aware of HartSong Ranch when we rescued Clipper, another Thoroughbred ex-racehorse, discovered nearly starved to death in Georgetown, California in August 2011. The Secretary/Treasurer of TROTT USA, a woman by the name of Christine Boyd who lives in Placerville, heard of Clipper’s dire circumstance and kindly offered to help in any way possible. In less than a year, with guidance from Christine and our incredible vets, Clipper was once again, in exceptional health and living the good life he so deserved. 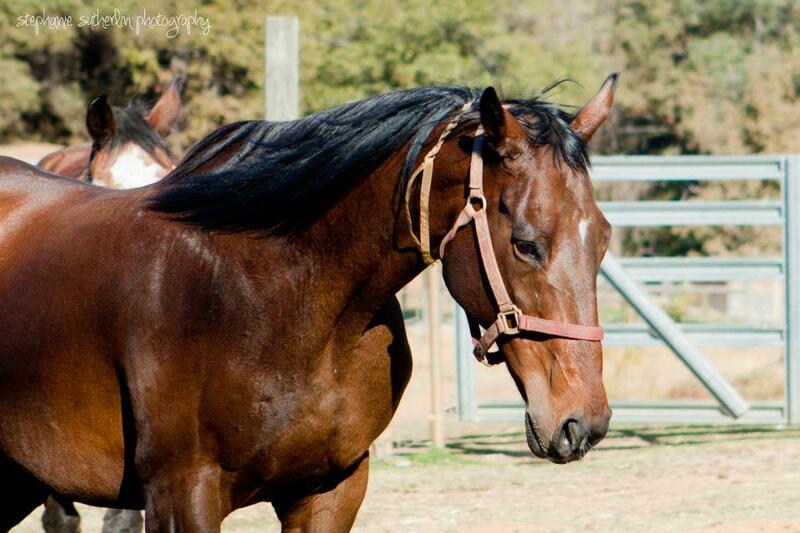 Sadly, Clipper was discovered dead next to his barn in February of 2013. We were never able to determine what caused him to die – the vets thought perhaps he had suffered a heart attack – a common occurrence with elderly Thoroughbreds or, perhaps he had fallen and broken his neck. Just like that – in the blink of an eye, Clipper was gone and HartSong’s barnyard was now a setting of heartache and loneliness – for us and for all of the horses. I promised myself that someday, somehow, someway – HartSong would save another of this most magnificent breed. In March of 2014, I received an email from Bonnie Adams. Knowing that HartSong was in search of another Thoroughbred ambassador and confident that HartSong would provide him with the very best of care, Bonnie kindly offered Scrumpy to HartSong. After many months of planning his transport, Scrumpy finally rolled down the long gravel driveway into HartSong’s barnyard on May 2, 2014. Scrumpy now has a bright, new future. He spends his days hanging out with his equine girlfriends, Deli, Ciara, Bess, Lacy and Grace – making the rounds – affectionately nibbling on their necks – making each to feel beautiful and special. They simply adore his soft, gentle ways. Following in Clipper’s footsteps, Scrumpy is now the voice for all other Thoroughbreds caught up in the horrors of the racing industry. Thus far in his life, Scrumpy has done everything anyone ever asked him to do and his reward was to be thrown away. 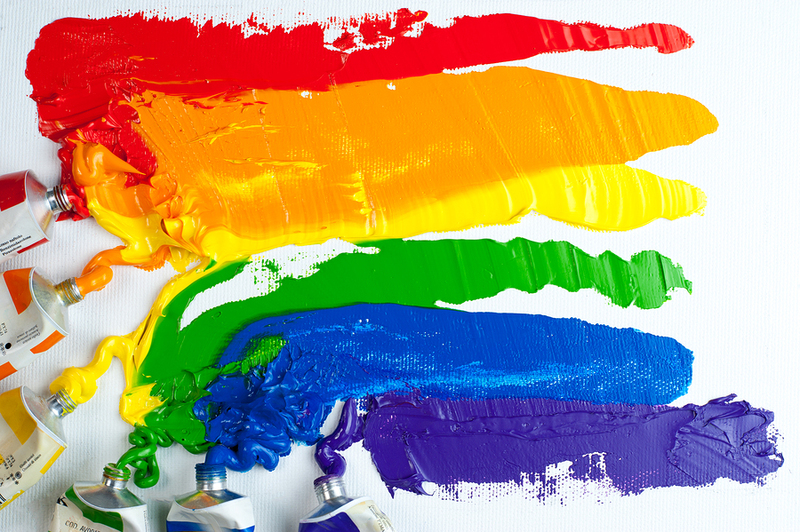 All we ask of him now – is to be happy, free and we hope – that someday soon, he will come to know – after years of searching – that he finally found his Peace – his Purpose and his Pride. *Of the 30,000 Thoroughbred foals born annually in the United States and registered with the racing industry, only 1% ever wins a stakes race – the top races in the industry. Scrumpy, before his injury, was fast – a big winner and a stakes horse. *In 2013, Scrumpy received a visit from Kyle Keanel – Scrumpy’s main jockey. Kyle stated that Scrumpy was his most favorite horse and also the smartest horse he had ever ridden. That’s Kyle riding Scrumpy in the racing photo. * Scrumpy is one of the lucky ones. According to the Department of Agriculture, over 100,000 horses a year are transported from America to Mexico and Canada for slaughter – most shipped in double – decker cattle trucks for hours, without food, water or rest. Upon arrival at the slaughter house, many, too weak to stand, are cattle prodded, dragged and whipped into the “kill box”. These horses endure a tremendous amount of suffering – they see other horses being slaughtered, they smell the blood, they hear the screams and they see their friends being hoisted up by one leg – many still conscious until they eventually bleed to death.